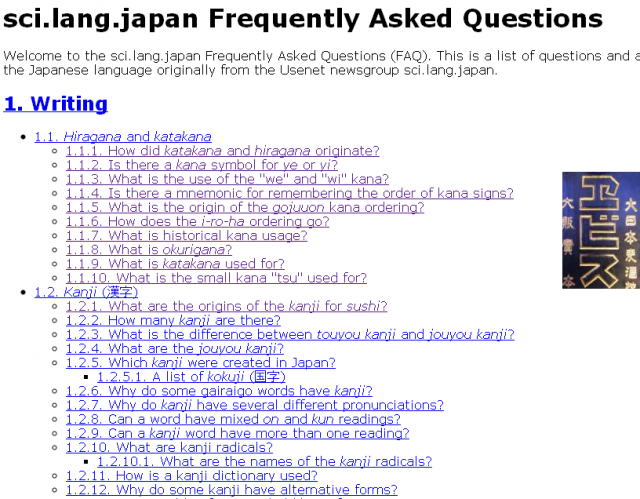 This website, operated by the same manager responsible for Kanji searches at sljfaq.org (Introduction article), presents a convenient collection of Frequently Asked Questions about Japan and the Japanese language. You can search for questions on 17 categories. There are various other useful functions too, including services for converting Japanese units and notation forms. 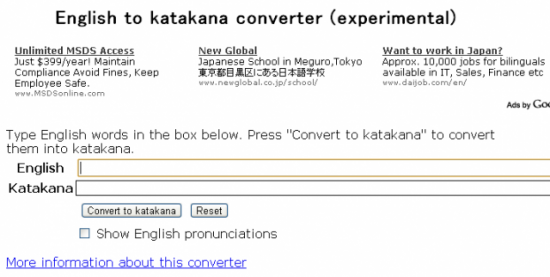 There is an English to katakana converter. There are functions that allow you to convert romaji to kana and kana to romaji. There is a number converter, where you can display western numbers (Arabic numerals) in kanji form. There is a converter to change old Japanese weight denominations into kilos, pounds and so on. There is a function that lets you see in simple terms how Japanese verbs conjugate in different tenses. You can look up the stroke order of kanji, or search for the meaning/reading of handwritten kanji. There are at least 4-5 questions in each category. Since there are lots of interesting contents to be found, you could well find yourself reading everything before you realize how much time has passed! Besides these questions, you will also find the menu below. but the way this feature works might be useful as a reference. Here is a list of additional useful converters, features etc. available on the website. Although there are other websites that offer a conversion-to-romaji function, this one offers detailed specifications to customise the system to your own preferences, i.e. in deciding how long vowel sounds are displayed and so on.